Rules here. Every member MUST read them. Introduce yourself here to the other members. Post suggestions to improve the forum here. You can find the Administrators here and ask them for any help you need. If you need a Moderator to help you with something you can contact them here. Request a test at a Tester's office here. Read their rules carefully. The best and only the best of the Academy will be in this dorm. Here will be the main members for Academy wars. The higher dorm of this Academy. Very skilled duelists are placed here. The step before Virtual Elite. The medium ranked dorm. 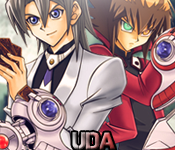 Here you will find duelists with a lot of potential to become good duelists. The step before Obelisk Blue. The lower ranked dorm. Players not so skillful are placed here. Hopefully they have potential to accomplish better ranks. Don't worry Slifers its not the end of the world! The step before Ra Yellow. Entrance exams for dorm ranks and Special exams for Tester/Mod ranks are found here. Buy all the decks your heart can wish here! Read deck shop creating rules. Buy other player's Graphic works over here! Read Graphic work shop rules. Buy videos of duels,shows,and other stuff here! Read Video shop rules. Duel against other members for Credits and post the wins here! Read Arena rules for each type of duel available in the Arena. Join the Virtual Arena to prove yourself as a duelist and show your skills. All VDA Tournaments will be organized here. Read tournament rules. Post your FREE duel videos here. Here you can discuss about a card or open a card discussion. All competitions will be held HERE. Show your decks here,also rate/fix other decks here. Read Deck showcase rules. Show cards that you made yourself here. Read card showcase rules. Show your Graphic works over here. Show FREE videos here! Read Video showcase rules.